Wall-to-wall windows in the living area and master bedroom with private terrace let you fully enjoy the delightful ocean views; screened front entrance allows the tropical breeze to waft through. First bedroom has 2 twin beds with exotic gauze canopies. 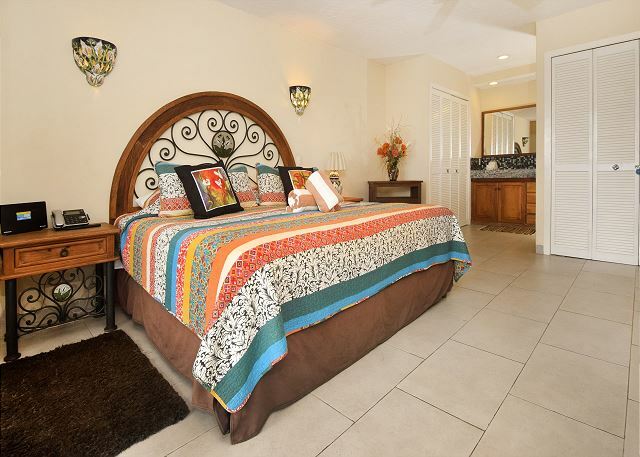 The spacious master suite has sea views, high ceilings, hand-painted ceramic wall sconces, TV, handcrafted vanity dresser, and adjoining bathroom. Living area decorated in soothing tones to draw the eye outward to the spectacular scenery. Suede furniture and wicker accents, with pull-out sofa bed for accommodating an extra guest. The open-concept kitchen has beautiful granite countertops and custom-made wine glass rack and bottle storage cabinet. Dining area for 4 and bar area for 2 with sea views. Ideally located in a quiet community but near all your favorite coffee shops, restaurants and stores on 5th Avenue. Condo complex amenities include pool with swim-up bar and beach volleyball on the widest beach in Playa del Carmen! The ideal choice for family in search of some well-deserved down-time! This is one of the few condos in the complex that includes high-speed Internet in the unit, along with free calls to the US & Canada.